As should come to no surprise to any of us by now, a very fluid situation took some twists and turns today. At first, it was reported that the swap between the New Orleans Pelicans and Sacramento Kings would be a simple one. The Kings would get Robin Lopez and Greivis Vasquez, while the Pelicans received Tyreke Evans. But we’ve been down this road before; we knew it wouldn’t be that easy. First, the Kings were waiting on an answer from free agent point guard Jose Calderon. If he decided to sign with the Kings, they would no longer have interest in Vasquez, and the deal would be on hold once again. But Calderon said no, and the trade was back on. But apparently, the Kings did not have much interest in Lopez. So, the Blazers were brought in to give some pieces back to the Kings and the Pelicans for the rights to Lopez, and they did just that by surrendering a 2nd round pick to Sacramento and Jeff Withey to the Pelicans. Withey was the 39th pick of the 2013 NBA draft, but he was a guy that was projected to go top-25 in nearly every mock draft. Personally, I had him ranked 17th on my Big Board. Like Lopez, he is a true 7-footer and because of his college experience, defensive IQ, and ability to finish at the rim, he is one of the few guys from the draft that is ready to play right now. While nobody expects Withey to play the minutes that Robin Lopez got last season, the conventional wisdom centers around the idea that Anthony Davis and Jason Smith will get more minutes at Center, meaning the Pelicans just need a guy who can give them 12-15. Jeff Withey can do that. Withey is primarily known for his defensive ability, both on the low post and at the rim. Remember how Anthony Davis won Final Four MOP despite shooting just 1-10 in the championship game? You wanna know why he shot 1-10? Because Jeff Withey was covering him all night. And it wasn’t a fluke. The game before that, Withey held First Team All-American Jared Sullinger to 13 points on 5 of 19 shooting. His length, quickness, and intelligence gave both men fits. That same season, Anthony Davis was taking the NCAA by storm, as he seemingly blocked everything. He averaged an astonishing 5.8 blocks per 40 minutes, which was tops in the NCAA. You know who was second? That’s right, Jeff Withey at 5.7. He is a beast on the defensive end, as evidenced by the fact that Kansas was #1 in the nation, allowing teams to shoot just 39% from two point range. Prior to Withey’s arrival, opponents shot 44.5%. Quite a difference. Withey does all this, and like Davis, he doesn’t commit fouls and that might be the most impressive thing. He registered just 2.6 fouls per 36 minutes; essentially 50% of how many blocks he registers in that same time. A 1:1 block to foul ratio is impressive. 2:1 is insane. He still has to work on his defense in space and his ability to hedge and recover in the pick and roll, but he at least has one elite skill, and that is well worth the 3-3.5 million dollars the Pelicans will pay him (total) over the next four seasons. On the offensive end, he is extremely limited, but he did lead the NCAA in FG% at the rim in non-post up possessions, shooting 79.2% on 3.4 attempts. Don’t expect much of a post game or an 18-footer, but Withey will create lanes for guards to pass the ball through and finish once he gets those passes. Don’t expect a big showing on the offensive glass either, or playmaking from the low post. Basically, Withey runs the baseline on offense, finishes everything, and makes shots at the rim very difficult on defense. Not a ton of upside here, but when you consider what the Pelicans needed and Withey’s price tag, you can argue that he is exactly what they were looking for. The Pels get a guy who is first rd talent who ended up in the second rd what an steal. Good call earlier on us grabbing this guy. I’m very happy with this deal. Michael McNamara Papa Pelican That´s is something we forget, with ZERO 2 rdn picks this year he got arguably two of the best five players available in the 2nd round! Monty gets his big and he’s all defense. Maybe he can develop a serviceable hook shot later on down the line. AngryCookies Is sure the other 2nd pick? with what protections? AngryCookies It´s almost to much what Dell could get of all this. It´s unbelievable! BTW i´m Lopez Fan, he isn´t flashy he´s a horrible def rebounder, he can´t jump or run like AD, but if you watch his game with GV he´s very intelligent(for playing with Nash i think), know how get his spots, when and where he need to shoot, and a very efficient finisher, just like a Brook lopez lite, and for 5 mill that is cheap today in the league, and he will be a good mentor for Leonard, who is a Brook´s clone! This is great. I agree Withey is a quality young C who can play, and bang, now which is what we need, for 25%-30% of a game. I love Whitey!!! Another great move, Mr. Demps!!! BTW,now we have probably the best two 2nd rounds in this draft! This how Ziggy(model´s developer) rank the center in the past draft, rank Withey like the 7th best, but b/t the 3rd and 7th are very short distance, only more(or less) risk(Aldriche is a factor in this) and different styles. WOW… keeps gettin better and better.. like this added bonus! How good is our 2014 first rounder looking? NO WAY he’s going backwards… I am so excited about 2014… Thank you DELL! 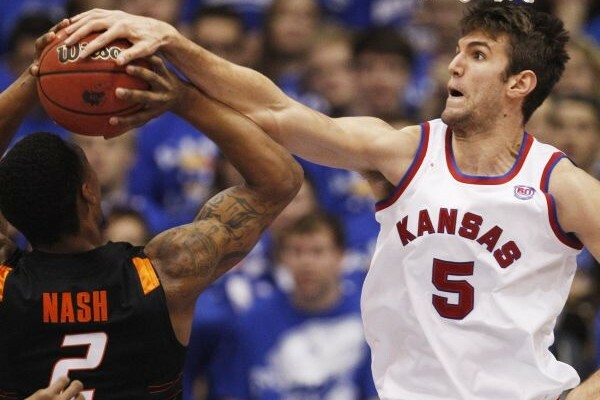 Withey is a MAN on D. He is relentless. Wow Wow Wow Wow Wow Wow!!!! I rarely comment but I can’t hold back how excited I am, Dell has done an absolutely superb job and deserves all the credit in the world. I could never imagine how to pull off such a great off season. Jeff Withey is just a cherry on top, the only reason so many teams passed on him was due to his obvious lack of potential on the offensive end, but 90% of bigs that do show any potential at that end never develop it anyway. He will far outplay his value when compared to other defensive bench bigs such as Mahinmi, Zaza, Dalembert etc. I’m loving not being in the media’s spotlight, I’m loving all the comments on Espn from people saying they think the Evans signing was terrible, that losing Vasquez and Lopez was silly because they were both just coming into their own in the league, and of course my favourite, trashing the Pelicans name. Because I know that one day they will never be able to deny the success this franchise will be experiencing and how wrong they once were. I’m so proud to say I’m a fan of one of the only meaningful and thoughtful team names in professional sports. Im so proud to be a fan of the underdog team that goes against the flow and does things their own way. (the pelicans model) I’m so proud to have an Elite GM that doesnt abide by tradition and builds his team on a ‘positions are dead’ ideology. Im proud to be an international fan of New Orleans. PelicanDownUnder Right there with you, man. All that and handsome to look at. Nice acquisition. How is his name pronounced? With-ee or Wit-he? I watched withey every time he came to play Baylor and the dudes a monster on D. I had no idea who he was the first time I saw him play in 2012 with Thomas Robinson but he made baylors star forwards Perry Jones and Quincy miller, who are both in the nba, look like high school freshman players on offense. He always out played every other player on the floor because his effort and defense and that included t-rob and and McLemore. Not saying he is better than McLemore over all but he can play and I think a lot of the teams that passed him up in the draft for some other centers will regret it. This is a fantastic get and I can’t wait to see the pelicans play! So we get 2 great picks out of this year’s draft, an all star point guard, a former rookie of the year, and we still have some room to get a pretty good SF……AND we still have what may turn out to be our best bargaining trade chip in Eric Gordon….that is just un-be-lieveable…WOW…we have added an incredible amount of athleticism to the team…and to think all of the analyzing so many have done didn’t reveal any of these pieces…what can you say but thanks to Dell, Mickey and the rest of the braintrust…can’t wait to see what the final move (or moves?) is! Pelicans back court is stacked. Don’t know what we are going to do at small forward. Just aquirred evans but I read a article that he might have a role as a “super sixth man”. If this is true, we shouldn’t have signed him because we need to fill up talent at small forward and center. Evans doesn’t do much for us. Andre igoudala would though. He would be the leader of our team. However, we just have to hope holiday can be a leader. If we can get a quality center besides Jeff withey then I think demps did a great job otherwise, they did terrible. Go pelicans! pelicans247 If you don’t have a good second team, you don’t win games…can’t we remember all the games we’ve lost over the years where they coach would reference that guys coming off the bench have to produce? I want to say Denver was the first I can remember that would put in all five at once and that group included Chris Anderson. They were a dynamic group that would get the crowd going…it was only that their starter were not elite at that time, just good, but it turned their team’s fortunes around when they could utilize their backups as weapons. Yeah this is our 3rd team: Roberts or Jackson, Rivers, Miller, Thomas, and Admunson. That was practically our 2nd team towards the end of last year! Now our 2nd team looks like Roberts or Jackson, Evans, ??? (Aminu is my guess), Anderson, Smith or Withey. That is a pretty dynamic group with players whose skills compliment each other. Plus we can mix some of them with a starting line-up of Holiday, Gordon, ??? (Wright I hope), Davis, and Smith or Withey to create or address match-up problems. How can anyone be upset with what Dell has done so far, and he still has cap space to spend on the SF position?! Sure, I can’t argue with that. But, we need a small forward. The small forward position has proved to be one of the most talented positions in the nba. Who is going to guard lebron James, Kevin Durant, Carmelo Anthony. We need someone with the physical tools to accomplish this as well as the skills to accomplish this. With evans on the bench, who will guard these high caliber players. You need a good second team, but you still need the gaping hole at the small forward position filled. We need a true center too. The only true center we have is Jeff Withey, and there is no telling how he will perform in the nba. Jason Smith has played at the 4 for almost all of his career and is used to playing in the post. We need a veteran center. OK so now we’ve got Jrue Holiday and Tyreke Evans, I say we trade Eric Gordon to the Rockets for Chandler Parsons and Omer Asik. Starting five of Holiday Evans Parsons Davis and Asik. A bench of Roberts Rivers Miller Anderson And Smith. Reserves include Jackson Mason Jr Thomas Amundson and Withey. That is a damn good team. Great trade, but why keep Lance Thomas? Undersized 4 that can’t jump, rebound or shoot. We can find a better rookie FA or DLeague gem. Great trade, however why would the rockets want Eric Gordon. They already have James harden. Eric Gordon’s salary makes him cost way too much for an injury prone sixth man. Also, why would they give up Chandler Parsons, unless they acquire a small forward like josh smith in free agency. Another reason that trade would never go through is that the rockets would be gaining some cap space, as minimal as it would be, so they would not go for the trade because they need to decrease cap space as much as they can to acquire dwight Howard and/or Josh smith. Eric Gordon’s contract would make him difficult to trade because he is not worth paying that much, unless he gets over his injuries. I don’t think Demps would have not investigated the possibility of Iggy. Maybe he and/or his people said No to the Pelicans before trading began. I like Evans and if he’s willing to play 6th man that makes him better in my eyes. My gut tells me that the Pelicans are serving EG10 notice that either he’s on board or we can move on. Michael McNamara Is the Jeff Witney part of the Deal confirmed? ESPN has not updated this part of the deal. I don’t want to get my hopes up. This kid appears to be a strong use of 15-20 per game which is what lopez was giving us. The other question is what about outside shooting? Who can we target to be a sharp shooter to go along with Ryno? Love Withey. I am a huge Kansas fan and I can say I’ve watched him for the last 2 years. He is great. Best shot blocker I have ever seen. Now, he has little skill on offense, and will probably never improve that area of his game much, but I don’t think that really matters. The only thing I am worried about is that he isn’t very athletic. I don’t know if he will struggle to have the same impact in the NBA, but he does have excellent timing and intuition, so I think he should be okay. Excited to see where the Pelicans go this year. Also, what is your opinions on Aminu? I really liked him when he would get minutes last year. He was a rebounding machine. Caffeinedisaster Where’s the I have no clue how someone who’s never played a minute of pro ball button? This is how i HOPE everything goes.